Exactly a year ago, it just so happened that I was fortunate enough to be in Amritsar while enroute to McLeodganj with two of my classmates. I have been here on two occasions, but the experience of Guru Nanak Jayanthi is something to be felt first hand here. 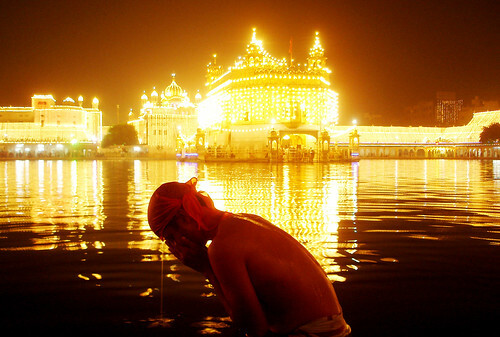 Harmandir Sahib has an energy of its own that entraps you as soon as you enter the temple complex. On the outside its bursting with energy, crowds thronging the langars, the din of plates being systematically cleaned and thrown using a human assembly line, offers of unlimited hot chai and rusk by the hundreds of volunteers looking for every opportunity to help the worshipers. And once you enter inside the main complex, the atmosphere becomes suddenly serene, the sarovar magnifying the beauty of the golden shrine that sits floating in the middle and enchanting all those who are in its view. The entire perimeter was lit by thousands of wax candles for the auspicious day. What you feel here is very different from that of a normal temple, I wouldnt even call this a temple, there are no idols, sculptures or photos here, only people, real people. What you feel here is warmth in the heart, in yours and those around you.